Whether you have one child or ten, dealing with tattletales can be an exhausting process. 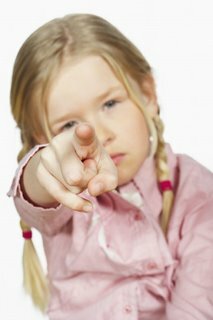 Kids will tattle for a variety of reasons, and once you know the motives behind it, it can be easier to tackle. Have them talk to the person/friend/sibling that is doing something wrong rather than telling you about it. Explain that they are gossiping and help them learn how to rectify the situation themselves. Have them explain their grievances to a stuffed animal. This helps them get it off their chests and feel “heard” without involving you. Ask your child to stop. Before they can get out the whole story, tell them that you do not want to hear it (even if it means you stop them midsentence). Have them think about why they are tattling. Ask them if they are trying to get back at someone, or if tattling helps them feel better about themselves. If they are tattling simply because they know something is wrong, then congratulate them on their morals and help them understand that they do not need to involve you whenever they see someone doing something wrong. Have them imagine what it would be like in the other person’s shoes. Ask them how they would feel if their sibling always tattled on them. Empower your child so they know how to act if someone wrongs them. Tell them some things they might try (ask them for the toy back, suggesting that they take turns with the toy) so that they can try those things before they come to you. Encourage positive behavior. Let them know when you see them doing the right thing. Encourage your kids with reinforcement and make sure you are reinforcing the good behaviors. This will help them establish how they should behave in certain situations. Once you give them the keys they will be able to succeed, just be patient. Guest Post by N-StyleID a retailer of medical alert charms. When I was in elementary school, there was a girl who tattled on everyone about every single little thing, and she didn’t have many friends. No one wanted to be around her because they knew, even at that young age, that they’d get told on for some reason. I couldn’t stand her for this reason. She was made fun of or left out (which BTW only made her tattling worse). She went to a different school and I met up with her several years later and in the time must have grown out of it because she’s super nice and funny and we talk every time we see each other out. Hey Angie! I am so sorry I did not reply sooner, been a crazy busy couple weeks. But I wanted to say thankyou for stopping by and commenting. There is always one child who is the tattler in school. I have experienced that too. I am really working hard with my children to not be tattlers. But it sure is hard.